Guided by a single photo found on the internet, a group of UCT boulderers set off for Botswana with rumours of granite covered koppies on the edge of the Kalahari desert. The village of Thamaga was the first stop, but the boulders did not yield many problems, although only a tiny fraction of the potential was explored, and the team moved further west to Moshupo. Here the stone quality seemed to improve and had more features. Gotau Hill was the focus of the trip and the first problem to fall, "Donkey Kong" 7B, was an instant classic and climbed a short overhanging prow. Andrew Wood moved further up the hill to establish a techinal arete problem dubbed "Hungry Lion" 7B. Marijus Šmigelskis spent some time exploring and discovered another cluster, in strong shade the entire afternoon which produced "Four Forces" 7A+ and "Twin Paradox" 7C. 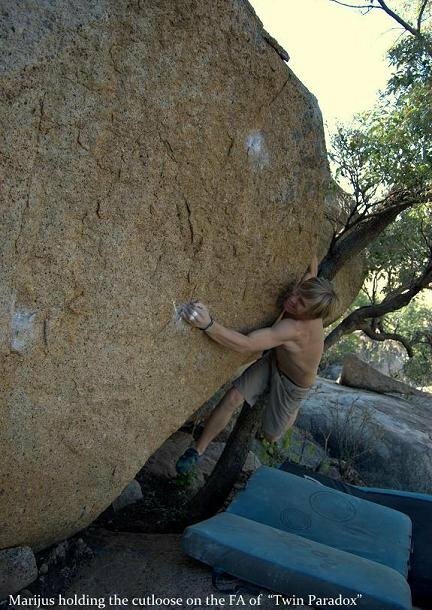 As the cherry on top, Marijus tried a blunt arete which seemed completely featureless at first, then after a few attempts only highly improbably, until somehow he pulled through the first move and sent the line to create "Dark Matter" 8A, boosted with extra energy from a mouthful of golden syrup. Check out the gallery and the video below.